Foreign investment in Nepal is regulated and administered by the Foreign Investment and Technology Transfer Act and Industrial Enterprises Act. The Department of Industries (DOI) is the sole agency for administration and implementation of the Foreign Investment and Technology Transfer Act in Nepal. Investment in kinds, e.g. machineries and equipment. However, as per the decision of the Governemnt made on September 5, 2012, the minimum amount of FDI has increased to NPR 5 million for each investor from USD 20,000 ( Approximately NPR 1.6 million). FITTA 1992 allows foreigners to invest only in private limited companies and in public limited companies registered with the Company Register Office (CRO). They are not allowed to invest in proprietorship or partnership firms. Prohibits any invitation to the public to subscribe in its shares. Offers shares and debentures to the public through a prospectus which complies with the requirements of the Companies Act 2006 and Securities Act 2007. Once the applicant submits the application with required documentation at the registration unit, it goes to the Director General who then forwards it to the FDI Director. The documents are assessed by the officers and staff at the FDI section. 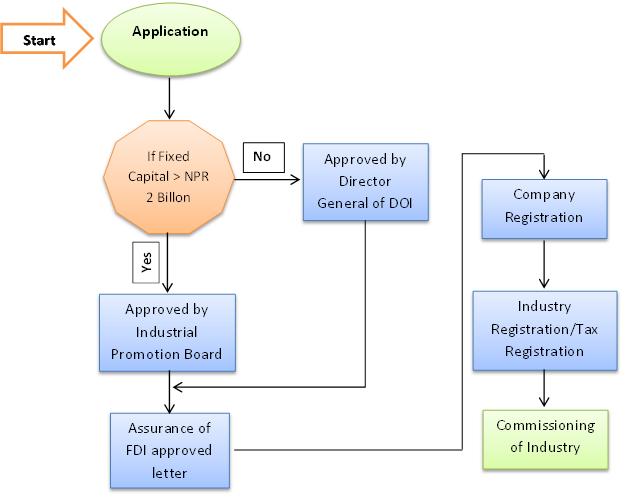 The application is presented in the FDI approval committee. Copies of the project reports must be sent to the License Director and Technical Director prior to the meeting. The members of the committee study the documents, discuss it objectively, and express their concerns, if any. Even if there are concerns expressed or other documents to be received, the applications are generally recommended for final approval with the condition that the concerns are addressed and the documents received. Once these conditions are fulfilled, the application is sent to the Director General for final approval. It takes 5-10 days for FDI approval, from the application date. After obtaining approval for foreign investment, the industry is required to apply for registration of industry at the DOI within 35 days. If the registration cannot be done within the stipulated time, the investor will have to apply for an extension of the validity period. Note: If the capital investment is more than NRs. 10 billion, the Investment Board can directly deal with the investor, and the procedure will be followed accordingly. The fees need to be deposited at the time of Foreign Investment Approval, and are refundable after the operation of industry. Similarly, an additional fee will be calculated at the rate of NPR 30 per NPR 100,000 of authorized capital. Acquisition of any foreign technical consultancy, management and marketing service. Verification of the uniqueness of a company name can now be done online. To reserve the available company name, the company must submit an application to the Office of the Company Registrar. The company name reservation can also be completed online for no charge. Although professional verification or certification prior to submission to the official agency is no longer required, entrepreneurs continue to use the services of professionals in practice for verifying and drafting the memorandum and articles of association. This is mainly done to avoid mistakes since there are no standard memorandum and articles of association's forms that entrepreneurs can use. More than NPR 100,000,000: NPR 43,000 plus NPR 30 for each additional NPR 100,000. The company must disclose the office address and withhold 10% tax of the rent for at least 3 months and deposit it to the tax office. If the company’s objectives include goods or services subject to VAT, both registrations (VAT and income tax) should be obtained simultaneously. From the basic salary of each employee, 10 % is deducted each month, and a matching contribution is made by employer. The contribution is made to the provident fund and released on employee retirement. The employer also has to pay gratuity on retirement of an employee at the rate prescribed by labor regulation. Both of these rules are applicable only if the company appoints 10 or more employees. Day 1: BuildCo submits the drawings to the municipality along with a copy of the title certificate. Day 4: The ward office checks the field and sends a notice to the site’s neighbors. Day 29: The municipality starts the process of issuing a temporary approval of the drawings. At least one of the neighbors must give their consent in order for the project to be approved. Otherwise, the builder can submit a "commitment letter" certifying that he is responsible for any potential dispute in the future. This can delay the approval process to around 2 months. The originals of all documents must be demonstrated when submitting the copies to the Urban Development Department of Kathmandu Metropolitan City. For apartment housing and group housing, the application fee is a flat 25.00 rupees per sq.ft. In addition to the building permit fee, the Urban Development Department also charges a Designer Fee of 2,000.00 rupees. The project designer must be licensed by the Department. The license is called Certificate of Designer and is renewed every year at the Municipality. The annual fee is 3,000.00 rupees. The Municipality charges an additional 2,000.00 rupees for each building design. The ward office visits the site and distributes a notice to neighbors. Before issuance of the completion certificate, the municipality conducts an on-site inspection to check if the construction conforms to the approved drawings. An inspector visits the site in 2-3 days after the request for completion certificate and writes a report to the more senior engineer. There will be 4 signatures on the completion certificate: (1) junior engineer, (2) senior engineer, (3) chief engineer of Kathmandu Metropolitan City and (4) departmental engineer. It takes approximately 7 days to get the certificate after the inspection. These signatures are required for any kind of permit. BuildCo submits an application for water and sewerage service to the drinking water and sewerage offices. The drinking and sewerage offices then send their recommendation to the road department to grant permission to dig the road for the connection. The Department of Roads then grants its permission to dig the road. The tap and sewer connection is then carried out. The client must fill out the application form and submit it to NTC together with company registration certificate, PAN, etc. NTC will check the junction box and give client the quote (deposit, connection fee, etc.). The photocopy of documents needed to be submitted along with application form mentioning the load in kW / MW and type of voltage (low voltage/medium voltage/high voltage) are: citizenship of owner, land deed, certificate issued from the commerce department to operate the warehouse, tax registration certificate, construction approval certificate from the municipality, contract agreement between land owner and warehouse runner, if the land is leased. No need of notarization, NEA personnel will attest after verification with the original copies. Approval of load estimate - In this case an approval from Regional director or Manager may be required – decided on case by case basis and in about 50% of cases, this might be so. It is expected that someone from owner’s side is present during external site inspection to answer any questions that NEA personnel might have. NEA personnel will make a visit to site to ascertain the appropriateness of the place where the energy meter is to be installed, and also they check the transformer installed at consumer's site (As per NEA rule, the consumer has to install his own transformer for the load above 50kVA.). Approval of load estimate is needed to decide how much of a supply is needed for the building. - In this case an approval from Regional director or Manager may be required – decided on case by case basis, and in about 50% of cases, this might be so. Cost includes purchase of Poles, Insulators, Transformer (150KVA), cutout, lightning arrestor, earthing materials, hardwares, drop cable, MCCB, meter box and other fitting materials. Cost also includes purchase of Distribution transformer. Distribution Transformer can only by purchased after approval of load estimate. Availability of DTs in ready stock is not always the case, and there is always some waiting time. The transformer has to be tested for quality as it has been purchased privately. The installation of the transformer is done by a private contractor. Customer has to make payment, submit NEA test report. The seller must go to the local government to certify the type of road that adjoins the property. Kathmandu municipality is divided into 25 wards. The seller has to go to the ward committee to take the certificate in one day and it costs Rs 3000. At the same time, he can obtain a tax clearance letter. A tax clearance certificate must be obtained from the Municipality regarding the payment of the property tax. If the property is not yet registered in the Municipality for tax purposes then it might take a few days to collect the necessary papers of building permit, land deed, land revenue papers, field visit of municipal engineers to verify and assess the property, etc. In any case it should not take more than seven days. The cost of obtaining certificate is different in different municipality. In Kathmandu Municipal corporation it cost NPR.105 to 1005 for obtaining certificate of access and building. NPR 5,000 for main road. NPR 3,000 for side road. NPR 2,000 for gravel road. NPR 1,000 for track road. Payment of land and building property tax. This tax is applicable only for plots containing buildings of any kind and if it is situated in municipal area. Legally, the parties can prepare the transfer deed by themselves, but normally it is done by the lekhandas, or scribes. Nepal and USA entered on Trade and Investment Framework Agreement (TIFA) on April, 2011. Industries established with foreign investment are entitled to enjoy all the facilities and incentives including income tax facilities as provided to the local investors. There is no discrimination between a Nepali and foreign investors, and among various foreign investors in matters of licensing, incorporation, tax, availability of visa, labor relation and repatriation. Indian workers do not require a visa. Indian investors can invest and repatriate in Indian currency, whereas third country investors can do so only in convertible currencies. Furthermore, some differential treatment may occur with investors from countries with which Nepal has entered into BIPPA. For industries with fixed assets investment of above NRs. 500 millions, disputes may be settled as mentioned in the Joint Venture Agreement/Share Purchase Agreement.